F. Scott Fitzgerald wrote in The Crack-Up (1936) that “the test of a first-rate intelligence is the ability to hold two opposed ideas in the mind at the same time, and still retain the ability to function”. Whether the same applies to corporate strategy can be the subject of doubt. But it is clear that Coach’s “one brand, two distribution channels” approach has not delivered the growth and earnings expected by shareholders. Coach is trying to elevate its brand in one channel, full price stores, while at the same time unwittingly depreciating the same brand through another channel, factory stores. An outside observer can be forgiven for viewing these efforts as “two opposed ideas in the mind”. The most successful companies tend to have a clear unambiguous mission and message. But Coach appears to be, on many levels, a company that is mired in ambiguity, or even confusion, which explains why its stock has drifted aimlessly for over a year while peers Michael Kors (KORS) and Kate Spade (FNP) have scaled new highs. 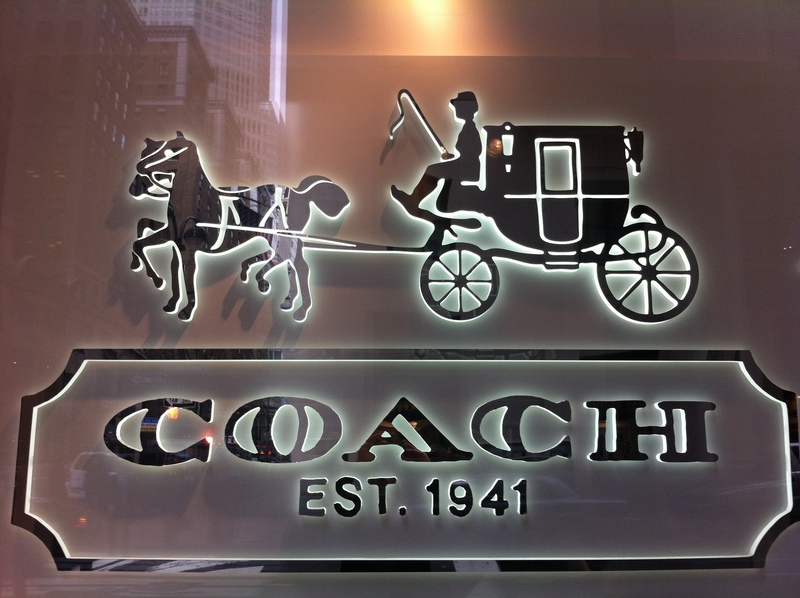 – Is Coach a luxury goods company? Yes. Its handbags come with a quality and price tag (several hundred to over a thousand dollars) that put them in the category of luxury for most consumers. It has “full price stores” in prime locations such as New York’s Fifth Avenue. Coach offers accessible luxury at a price point where the European luxury players cannot compete effectively. No. Coach’s pricing is far below that of European über luxury names like Hermès, Bulgari or Louis Vuitton. Coach derives two thirds of its North American sales from lower-priced sales at factory outlets. That is nearly half of total sales, a percentage that is too high for a true luxury company. In addition, Coach runs too many discounted sales for a luxury company. Between Thanksgiving Week and the end of the year, I counted no fewer than a dozen discounted sales on Coach’s Twitter account. (Side note: It is not clear why Coach advertises some of its discount sales as “Semi-Annual”. This practice encourages some customers to just wait a few months for better prices). – Will Coach be a growing company again? Yes. The company is seeing rapid growth in its men’s line and in international sales, most notably in China. International comps will improve in 2014 as the Yen’s near-30% decline phases out gradually. An acceleration in the US recovery will help North American sales rise again. No. North America sales are in decline due to structural, not cyclical, reasons, in particular the aging of Coach’s customer demographic. – Does Coach have a strong management team? Yes. Coach is highly profitable, generates strong cash flow and has no debt. Management has taken decisive steps to develop new revenue streams. For example, the men’s line now accounts for over 10% of total sales. And sales in China are booming. No. Coach was too slow to develop a foreign presence. In North America, an overreliance on factory outlets has damaged the brand. And the effort to transform Coach into a broader lifestyle brand raises its risk profile since it is no longer just “sticking to its knitting”. – Is Coach still a hot brand? Yes. Coach’s new creative director, Stuart Vevers, will reinvigorate the brand with new products that will be introduced this week at Fashion Week in New York. No. Michael Kors, Tory Burch, Kate Spade are the new hot brands. Coach is associated with an older demographic and is past its prime. It will be difficult to rejuvenate the brand. – Is Coach a good investment? Yes. It has a low valuation and strong cash generation. Growth will return in 2014. The disconnect between valuation and profitability will correct itself through a rise in valuation. No. North America will remain a problem for a long time and margins will continue to erode. The disconnect between valuation and profitability will correct itself through a decline in profitability. If I am interpreting this message correctly, Ms. Della Badia is saying that Coach can make more money selling a large number of sub-$300 handbags at factory outlets, than a smaller number of higher priced handbags at full price stores. This is disconcerting talk from a luxury goods company. But it fits a now familiar pattern: Coach likes to speak the language of luxury but it is largely pursuing a mass-market volume strategy. Coach continues to open new stores at factory outlets. What Mr. Luis is saying, again if I am interpreting this correctly, is that the full-price store is an important driver of the company and “just as important, if not more so”, it is a place to valorize the brand and the factory outlet business. If this means that the luxury higher end business is an important place to advertise the factory outlets, then we are in tail-wags-the-dog mode with full-price stores seen as essential to boost factory sales, instead of factory stores seen as an unfortunate but needed outlet to clear some excess inventory. Both Ms. Della Badia’s and Mr. Luis’ statements indicate that the factory store is one of the company’s core businesses, if not the main core business. But this business poses a threat to brand equity, to growth and to profit margins. In my last article on Coach, I speculated that it may be the target of a takeover. 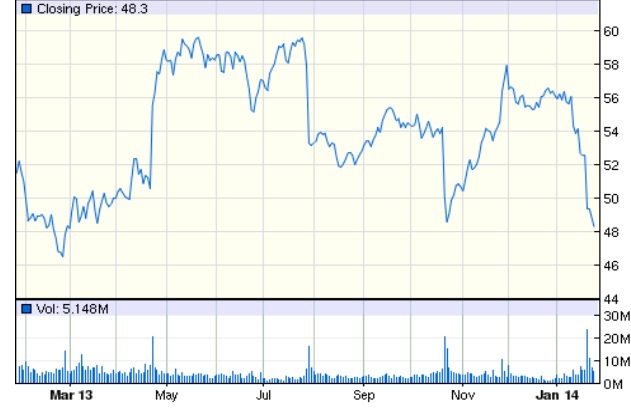 Since then, the stock has made a round trip from the high 40s to the high 50s and back. This is yet another iteration in a tug of war between some investors who have given up and others who keep waiting for Coach to perform. Will Coach shareholders make things otherwise? P.S. Michael Kors reported another stellar quarter this morning. Disclaimer: The views expressed here are not intended to encourage the reader to trade, buy or sell Coach stock or any other security. The reader is responsible for any loss he may incur in such trading. That’s a sentence you do not want to see when you are looking at a company which is viewed by many as a significant player in the booming global luxury goods sector. And yet, there it is, in Coach’s first quarter report released a few days ago. To be fair, the slight decrease in sales was due to rare and large currency fluctuations. The dollar rose by 27% against the Yen in the last year, an extreme move not often seen with major currencies. On a constant currency basis, international sales rose 9% in the quarter, which is reasonable but not a barn burner. A bright spot was China where sales boomed 35%. So there was some good news behind the headline. Despite the Q1 disappointment, Coach’s net income and free cash flow margins remain strong. Its main problem is not profitability but the fact that North America contributes 67% of total revenues and has essentially gone ex-growth. If you put Coach in the bucket of luxury goods companies (which are mostly European), it is clear that Coach is badly underperforming. Sector peers LVMH, Burberry, Richemont and others have zoomed ahead with sales, profits and stock prices not far from their all time highs. The main reasons for their greater success have been their more aggressive expansion into Asia and stronger brand management. But if you put Coach in a more general bucket of consumer and apparel companies, then it is doing better than some and worse than others. The issue however is that the company’s future will be largely determined by which bucket it puts itself in. As a luxury goods company, it can maintain some pricing power and it will preserve or raise its margins and market value. It could also merge with or be acquired by one of the Europeans. But as a general consumer company, its brand will get tarnished. Its margins will continue to erode and so will its valuation. – An insufficient geographic footprint outside the US. – A large North American presence which has stalled. – A brand that is in danger of falling out of the “luxury” sector. The store opening program can be accelerated overseas if there is sufficient confidence that the luxury boom will continue. Coach has a strong balance sheet and is generating positive free cash flow. In theory, therefore, it has important untapped reserves which it can deploy to open stores at an accelerated rate. North America will be more difficult to fix, given intense competition from the likes of Michael Kors and Kate Spade. Here, design appeal and brand management are key to an eventual recovery. Coach faces the risk of what the French call “Cardinisation”, the fate met by the Pierre Cardin brand when it became so ubiquitous that it lost its luxury stamp. In this sense, the fact that 60% of Coach’s North American sales occur in factory outlets is positively troubling. Sales at these outlets come at better margins because of lower costs and higher volumes but they damage the brand and could reclassify it outside of the luxury sector. And that could be the beginning of a death spiral for pricing. A quicker fix would be to sell the company to another luxury goods firm. An acquirer who already has a large presence in Asia and Europe could quickly boost Coach’s overseas revenues and lower its costs. Conversely, Coach’s large US presence could be of benefit to an acquirer looking to grow its own American sales. One problem is that a buyer may initially look to strengthen the brand by closing some factory outlets. This could reduce North American volumes in the near term, a consideration which may depress any proposed takeover premium. So is this a good price to buy the stock? Yes, because international sales growth will soon return and for the possibility of a takeover. No, because branding issues and North America are unlikely to be resolved in the next quarter. All in, it is a buy for speculative portfolios. More conservative investors should look to buy at a lower price if the company takes steps to avoid further erosion of its margins and to move its brand upscale. Note: Last year, I wrote more generally about prospects for the luxury goods sector. BMW, Louis Vuitton, Swatch: Can the Boom Continue? Diamonds are forever. What about growth in the luxury sector? A few months after Porsche teamed up with RIM to offer the Porsche Blackberry, Tonino Lamborghini recently announced the introduction of three gold plated cell phones (priced $1,850 to $2,750) and of an Android tablet ($2,300) aimed at the Russian market. This story neatly captures the current state of play in the global luxury industry: a prestigious European brand flashing a status product at a BRIC consumer. Notwithstanding the gloom emanating from daily European headlines, the continent’s luxury sector has been riding an unprecedented expansion. With their aggregate 70% market share in global luxury goods, a slew of European companies have been living their best years ever. Sales have risen strongly at BMW. And at LVMH, the French parent of Louis Vuitton, Dom Perignon, Bulgari and Tag Heuer. And at Hermes and Burberry. And at Swatch Group, the Swiss parent of Breguet, Glashütte, Blancpain and Omega. In the two years 2010-11, BMW increased its sales by over 17% annually. LVMH increased theirs by an average 14%, Hermes by 18%, and Swatch by 22%. With record margins and cash flows, these results are oddly incongruous with a global economy limping and stumbling out of (or through, or back into) the 2008 financial crisis. The boom has been fuelled by rising demand in the BRIC countries and, to a lesser extent, in the United States. In 2011, sales in Asia (including Japan) were 28% of total revenues at BMW, 35% at LVMH, and as much as 54% at Swatch. At LVMH in 2011, sales in Asia ex-Japan and in the US grew by 27% and 18% year-on-year, respectively. For BMW, Asia represented 22.5% of unit sales in 2011, up from 10.6% in 2007. If the rich, per F. Scott Fitzgerald, are different from you and me, then the suppliers and courtiers who pander assiduously to their vanity or sense of perfectionism, the purveyors of the finest consumer products on earth, are certainly different from the average consumer company. Whether by sheer luck or brilliant foresight, luxury goods companies now find themselves at the nexus of two main drivers of demand. First, the global rich, whose numbers have been increasing, are less sensitive to the economic cycle. They have big reserves of savings and can spend on luxury items even if their incomes falter for a year or two. Most will continue to consume luxury unless the economy is hit by a severe downturn. One of the reasons that BMW is bullish on the future is its expectation that the number of millionaires will continue to rise in developed markets as well as in the BRIC countries and Turkey and South Korea (identified as the BRIKT + China in a BMW presentation). Second, the newly rich and middle class in emerging markets have embraced luxury products with a vengeance. Like the Japanese in the 1990s, shoppers in the BRIC countries are today’s most profligate luxury customers. Chinese buyers discovered luxury brands years ago and they have been buying with gusto. Significantly, their buying power and obsession with luxury is felt far beyond their borders. According to the Boston Consulting Group, travelers from emerging markets (tourists and business people) account for a large share of global luxury sales, even if some of these sales are recorded in Paris, New York or Tokyo. BCG says that the Chinese spend as much on luxury while away as they do at home. Barring a global recession, these two groups, the rich everywhere and the middle class in emerging markets, will continue to spend on luxury products and, increasingly, on luxury services. These are undoubtedly the best of times for the luxury sector. The question then becomes: what will derail the boom? A shift in demographics could do it. In general, the world is full of coincidences but it would be foolish to accept all of them at face value. Sometimes it makes sense to ask questions to find out whether two concurrent events are really a coincidence or whether they are related. Among coincidences that we should not take at face value are important reversals in markets which occur at the same time as demographic inflection points. For example, the Japanese stock market peaked in 1990, the same year that the number of Japanese turning 40 also peaked. It could be a coincidence but then the US stock market peaked in 2000, the same year that the number of Americans turning 40 also peaked. It could be another coincidence or alternatively, there could be a poorly understood dynamic underlying the stock market, a dynamic directly linked to demographics, aging and investing etc. (The Chinese stock market peaked in 2007, one to five years after the number of Chinese turning 40 hit its own peak). Demographics are generally ignored or underestimated by market participants. They are often seen as far-removed inputs in the economy which eventually manifest themselves through other measures. For example, an investor may ignore the change in demographics in a given area or region or country, confident in the knowledge that any significant shift will eventually appear in monthly retail or housing data or other economic indicators. The only problem with this thinking is a large gap in timing. Monthly status updates from the economy are mostly embedded in market prices by the time they are released. By contrast, an analysis of demographic trends can help make a forecast several months or even years before significant changes filter through the monthly economic data. One demographic measure which should certainly be examined in its relation to markets is the dependency ratio which measures the number of dependents per working adult (it is the sum of people under 14 and over 65, divided by the number of people aged 15-64). The table (compiled from a UN 2010 report) shows the ratio (per 100 people) for various countries and regions. A declining ratio is generally positive for the economy because income earners have fewer dependents and can divert dollars to investing and spending. The world’s dependency ratio which fell steadily from 1970 to 2010 will be essentially flat until 2020-30 and will start to rise beyond 2030. In the US and Europe, the ratio hit bottom around 2010 and will rise in future decades. But in Japan, it hit bottom in 1990 and has been rising ever since. Perhaps this explains in part Japan’s lost decade which turned into two lost decades. In the BRIC countries, the dependency ratio is still falling in Brazil and India, but it is near bottom and is set to rise in Russia and China. And in Africa, the ratio will continue to fall for a long time. As the ratio rises, there will be fewer dollars to spend on discretionary items because more of these dollars will have to be redirected to taking care of dependents, whether this is done directly through assisting family members or indirectly through charities or government social programs. Which brings us back to luxury goods, in some ways the quintessential discretionary items. Will a rise in the dependency ratio in developed countries, in Russia and in China lead to a slowdown for the sector? Looking into the future, the case of Japan can be informative. It was not long ago that the Japanese were avid buyers of luxury goods, both at home and while traveling. But a 2009 study by McKinsey found that the Japanese appetite for luxury goods has been on the wane since 2001 (in volume terms) and it noted that their purchases started to decline (in currency terms) in mid-2006, two full years before the onset of the financial crisis. Whether by coincidence or causality (the latter in my opinion), the demographic data fits well with this turn of events. Because of a low birth rate and an ageing population, Japan’s dependency ratio, 0.43 in 1990, rose modestly to 0.47 by 2000 and more briskly to 0.56 by 2010. It is on its way to 0.7 in 2020. Nonetheless, heavy investing by luxury companies over several decades means that the Japanese luxury market remains the second largest in the world, after that of the United States. LVMH has 360 stores in Japan, a country 10% smaller than California, vs. 621 for all of the US. The dependency ratio is bottoming in Russia and China but it will only rise slowly for the next 10 to 15 years. This suggests that, barring other developments, the luxury sector could continue to do well, but its growth rate may taper off. Of all the BRIC countries, India’s ratio looks the most promising and it offers the best longer term profile if its policymakers can set the country on a path to reap the demographic dividend resulting from a decline in its fertility rate. Although luxury companies have a presence in India, their footprint is much smaller than in China and Japan. For example, Louis Vuitton has over 50 stores in Japan, 39 stores in China and 4 in India. Africa will see a steady decline of its dependency ratio in the 21st century. Luxury companies have a small to nonexistent presence on the continent. Swatch Group records a minuscule 0.6% of its sales there. Louis Vuitton has three stores, of which two in South Africa and one in Morocco, but none in oil-rich Angola or Nigeria. Porsche has seven ‘Porsche Centres’ in Africa, of which three in South Africa and one each in Angola, Nigeria, Egypt and Ghana. But it has 42 ‘Centres’ in China, 23 in Russia and 8 in Brazil. Although store count is an incomplete measure (because of sales through third party outlets), a larger number of own-brand stores denotes a greater confidence in the stability and growth of a given market. If Africa is the next economic frontier, these are indeed very early days for luxury goods companies on the continent. “The ongoing redistribution of cost advantages in labor-intensive manufacturing presents an opportunity for Sub-Saharan Africa to start producing many light manufactures, enhance private investment and create millions of jobs. In its report, BCG estimated that sales of the global luxury sector amounted to $660 billion in goods (including luxury cars) and another $770 billion in services. BCG also highlighted a gradual shift in customer preference from owning luxury (goods) to experiencing luxury (services). Experiential luxury includes spa services, safaris, luxury travel, fine dining, special art auctions and other services. BCG deems this subsector to be growing by 12% per year while the market for luxury goods grows by 3 to 7%. A key driver of experiential luxury is the aging of the population in North America, Europe, Japan and China. As people get older, they are less interested in owning expensive watches and handbags and more interested in valuable experiences. Some luxury product companies are trying to position accordingly. In its considerable portfolio, LVMH now also counts Cheval Blanc, a high-end hotel in Courchevel. But these efforts are so far embryonic. So can the boom last? Yes, but projecting into the future the strategy of the past ten years will not be enough. The reversal of the dependency ratio in several BRIC countries and the rise of experiential luxury in developed markets pose the biggest challenges. Luxury goods companies will have to adapt their geographic and product footprint accordingly. In the near-term, wider concerns about the global economy override demographic developments. But in the longer term, India and Africa look like promising frontiers while the rest of the world (including China) grapples with an older population and a rising number of dependents.